Exclusive Beach Colony is located on 11 acres of fabulous beachfront. The ingenious angular living room design transforms every residence into a Corner unit. Wall-to-wall sliding doors and adjoining windows actually wrap around the living room, filling it with light, and revealing the panoramic beauty of the Gulf. The sweeping 300 SF terrace will be a favorite spot for quiet moments and lively gatherings alike. The uniquely situated Master Bath is a world unto itself. The whirlpool bath is surrounded by large, wrap-around windows, which can open to offer both a view and a feel of the hypnotic Gulf. 1750 SF with Tile throughout Living, Dining, Kitchen and Carpet in Bedrooms. The owners have recently upgraded Living Room furnishings, bed linen and electronics. 65" Smart TV in Living Room, 50" Smart TV in Master Bedroom, 50" TV in Guest Bedroom and 40" TV in Guest Bedroom. Everyone was helpful and considerate. We had a relaxing and worry free vacation at your resort. 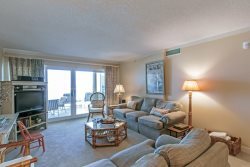 What an amazing condo with breathtaking views of the GOM! Everything needed to cook wonderful meals is there go y'all in the kitchen. The property has both indoor & outdoor pools as well as an indoor jacuzzi which was the perfect spot to warm up after a sunset stroll on the white sand beach. Multiple charcoal BBQ pits & cooking area near the pool. More amenities on the gated property & left my Jeep "naked" all week as security was walking the lot day & night. Very safe area & near everything in Perdido Key.